Garza Blanca Real Estate in Puerto Vallarta has just announced its latest accolade, this time for its Grand Penthouse. 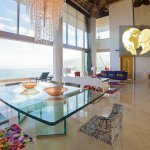 The Grand Penthouse at Garza Blanca Resort & Spa in Puerto Vallarta has received the top accolade which can be bestowed in Mexico and Central America; an award from the World Travel Awards. It beat off competition from the Four Seasons and the Hilton. The impressive three bedroom suite is also available for purchase! The Grand Penthouse at Garza Blanca Real Estate is the crown jewel in this resort; it sits atop a stunning hillside which affords it a wonderful view of Banderas Bay. The palapa roof means that it looks great from the outside, but the inside is what really matters! The rooms are spacious, decorated to the highest standard, and kitted out with the best of the best when it comes to mod-cons and fittings. The World Travel Awards™ were initially established in 1993 in order to celebrate, promote, and recognize excellence in the travel, tourism, and hospitality industries. Today this program of awards and Galas is one of the most reputable in the world, and this year the World Travel Awards™ is celebrating its 24th anniversary. The regional Galas are seen to be milestones throughout the year, and they draw in important people and figureheads from every area of these industries, and even from the media! The Program and its winners are featured across 6 social media platforms in 10 languages, including Russian, Arabic, and Mandarin. In December 2017 the World Travel Awards™ Grand Tour will feature ceremonies in various regions of the world; the winners will then compete head to head in their corresponding world categories. The winners will be announced at the Grand Finale in December.